It has been crazy in our since since we came back from our vacation at the beginning of September. We jumped right into the fall schedule of co-ops, school lessons, choir, dance classes, and my evenings at my music studio. It feels non-stop, but when we have an empty weekend as a family it feels sweet and refreshing. Next week Sebastian starts piano lessons with his choir teacher. I have never seen him so excited about something before! I hope he enjoys his time and learns to love making music. Sebastian is 35 days into his first grade year and loves history and science.We have started over with his penmanship because it is horrible. Boys really don't like handwriting, do they? Kaelyn has been having a great time with her preschool lessons. She loves the crafts and has a great time showing off what she accomplishes each day. This weekend we are going to see my younger brother at a band competition at my old high school. 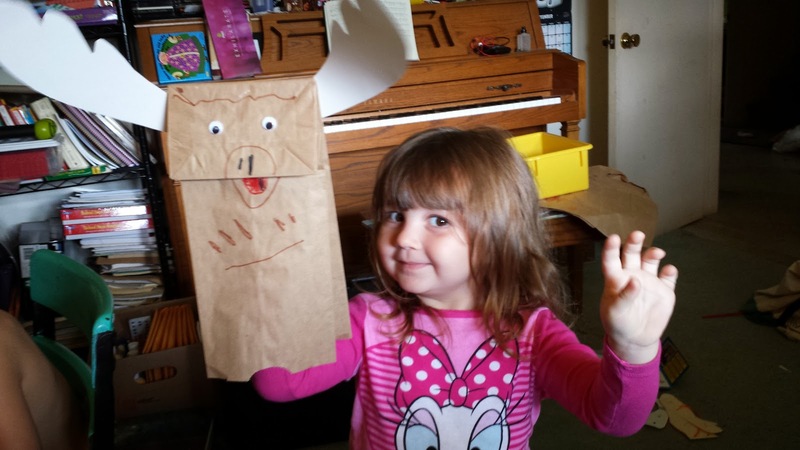 Kaelyn made a moose puppet!